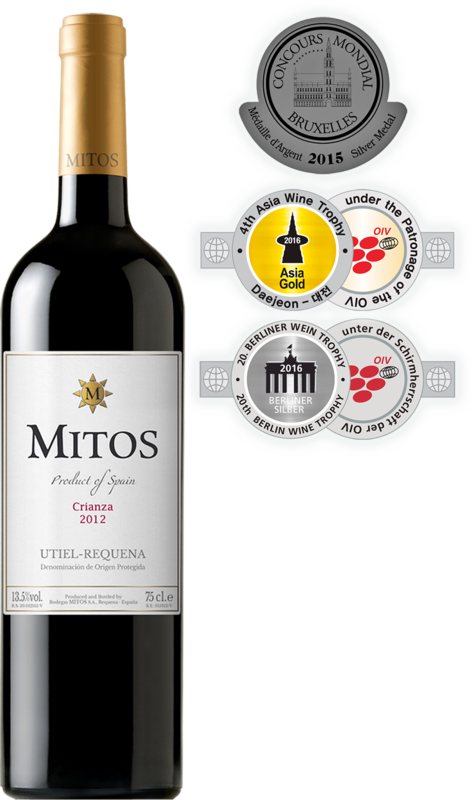 MITOS Crianza Wine has well matured grapes of Cabernet Sauvignon and Tempranillo fermented together in equal proportions for a longer period. Then this wine is fined and aged in a balanced selection of oak providing it its unique character and flavours. Varieties: Tempranillo (50%), Cabernet Sauvignon (50%). Aroma: Ripe fruit, toasts, coffee, cocoa, cinnamon and vanilla. Colour: Bright and deep ripe cherry red. Taste: Round, well balanced and very elegant. Fruity and mellow toast together with spices and chocolate. A long and intense aftertaste of red liquorice. Ageing: 6 – 8 months in French and American oak barrels. Minimum of 18 months in the bottle. Awards: Silver at Berliner Wein Trophy 2016 and Silver at Concours Mondial de Bruxelles 2014.